Currently, when you use your Discover More Credit Card you receive 5% cashback, up to $1,500 for restaurants and movies. 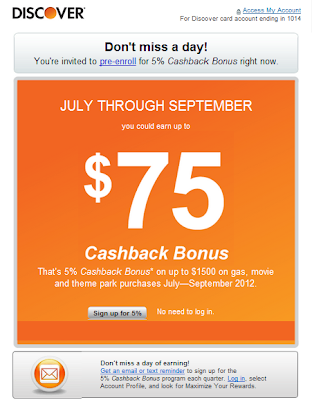 Today I received this email to pre-enroll for the next quarter's bonus cashback for July through September 2012. That's a $75 savings. Essentially, if you spend $1,500 every quarter in the bonus categories you will save $300 yearly. If you and your spouse both have this card, then you will save $600 a year. All these small savings really add up in the end. The best part is that there is no annual fee on this card. But be careful, there is a foreign transaction fee, so don't use it overseas. If you don't have this credit card you can apply for it now with my referral link Apply Now!